Last weekend was my high school’s alumni event and I was tagged as the official photographer by the C. W. Baker Alumni Association. This event pushed my photographic skills from concert, people, fireworks to documentary photography. To create a fun reunion covering class years over the last 60 years, get the school's Pep band to open the weekend, get quality entertainment on an outdoor stage, good food on a river boat cruise and mix in classmates reliving and creating memories. All photos taken with a Nikon D700 camera and 24-85mm lens. This was my first time attending the annual alumni weekend in Baldwinsville, New York. I got to meet and photograph members from the 1960’s right up to this year’s graduating class. Talked to people who attended one room schoolhouses, the old academy (which was my elementary school) and when the current high school housed the junior high classes until the junior high was built. During a Seneca River lunch cruise, we went through Baldwinsville’s Lock 24. As the captain explained how no pumps were used in raising the water level, it got us all to talking about the physics of the lock and the science teachers we all had during high school. Many such discussions over the weekend would spur old memories as we caught up we each others lives. Paper Mill Island was the site of the evening events. The first concert night was headlined by Bon Jersey, a Bon Jovi tribute band, featuring lead singer Joe Ventura. The second night was a combined event with the Village of Baldwinsville and had a VIP area for the returning alumni. The area gave us all time to reconnect with old friends and create new memories as we reminisced about the good times passed. 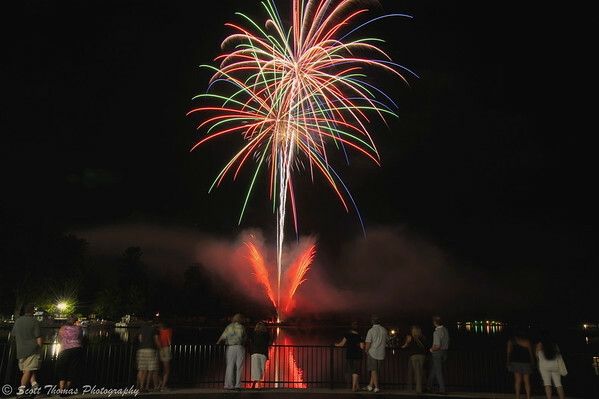 Members of the Alumni of the C. W. Baker High School watch fireworks from Paper Mill Island in Baldwinsville, New York. Nikon D700/24-85mm, 21.2s, f/16, ISO 200, EV 0, 24mm focal length, tripod. 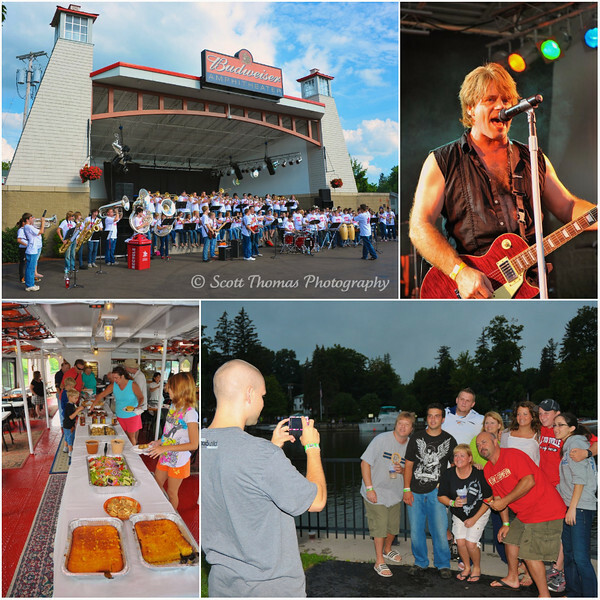 This entry was posted in People, Weekly View and tagged 24-85mm, alumni association, amphitheater, baldwinsville, barge canal, bon jersey, budweiser, buffet, c. w. baker, concert, cruise, declaration of sentiments, fireworks, flash, high school, lock 24, music, new york, nikon D700, nikon SB-600, paper mill island. Bookmark the permalink. Very cool, Scott! Any self portraits from the weekend? Not a self-portrait but one taken with my camera. Does that count? Only if you post it! 😉 Or maybe you are saving it for a certain photo hunt? Yeah, I need a vacation from my summer. LOL The next couple of weekends should be quiet before the NYS Fair starts up. These photos are great…..your class was lucky to have you photographing! They have told me how much the like my photos of the event. Always good to hear. Thanks, Kristi! Great set of photos, everyone looked so happy. I love the fireworks shot, maybe someday I’ll get to try. They are lucky having a photographer with such a good eye. Fireworks! You are an expert on that Scott. Thanks, Carsten! It really wasn’t until I took the time to shoot fireworks and make mistakes while doing it that I got better at it. Gee, that’s an analogy from life, isn’t it? – But unfortunately there is no ctrl-z in life.